MUA members are leaders from the moment they enter our doors. Our programs create the environment for Latina immigrants to identify the leadership skills they already possess as well as identify new areas of growth. 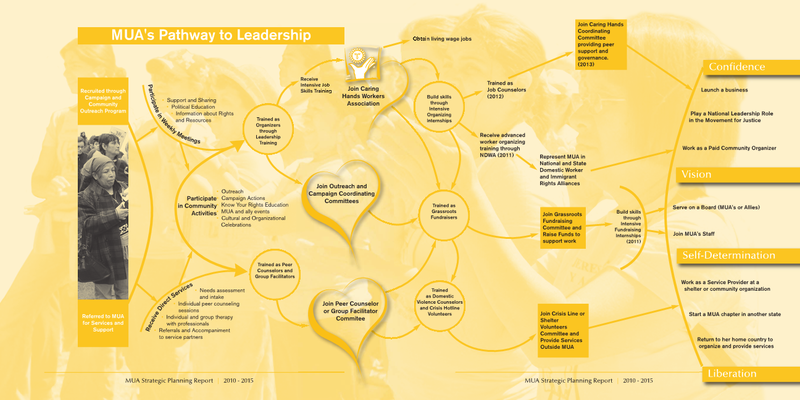 MUA has a clearly defined Pathway to Leadership for our members. We believe that our members are best suited to lead our organization and know that they have the capacity to bring this leadership to other community organizations and our social justice movements. From the first time a Latina immigrant visits us, she is invited to participate in political actions and education workshops. After a short period of participation in our programs, she can choose to participate in our Leadership and Unity for Community Power training – which is the launching point to becoming a community organizing – and/or our Peer Counseling training – which allows her to model healing and provide support to newer members seeking out community resources. After volunteering with MUA’s Comite Corazon (Political Committee) planning campaigns and participating in actions or as a Consejera (Peer Counselor) providing individualized sessions, offering referrals, and accompanying women to community partners, members can deepen their leadership by becoming Community Organizers, Meeting/Workshop Facilitators, and Grassroots Fundraisers. Leaders with more experience can also become certified as Domestic Violence Advocates and Sexual Assault Crisis Counselors volunteering at local shelters to ensure language access and cultural competency and staffing MUA’s own crisis line. MUA leaders serve on our Board of Directors as well as the Boards of our community partners, represent us in local coalitions, and are looked to when new staffing opportunities open at our organization. Download PDF: "pathway to LeadershipSMALL"